I have another fun and easy project for you to do in the kitchen. Be careful though, these are so delicious they might not make it to their final destination. You may have seen these before. 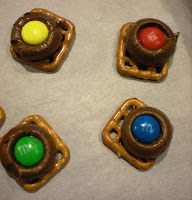 They are pretzel squares with melted chocolate and an M&M on top. They are very easy to create with your little one. Preheat the oven to 250 degrees. You can either spray a cookie sheet with non-stick baking spray, or I use parchment paper. The pretzels get placed on the cookie sheet. Unwrap the Hershey Kisses and place one Kiss on top of each pretzel. Put them in the oven for bake for 2 minutes. Remove them from oven and place one M&M on top of each Hershey Kiss, press down slightly so the Kiss is flattened a little. Place them in the refrigerator to cool. Store leftovers in the refrigerator or freezer. This year we are making these, hopefully, with dark chocolate. Also, I always make them at Christmas time so I use the red and green M&M's. Enjoy. Note: When you put them in the oven, your objective is to have them in there long enough to just soften the Hershey Kiss enough to flatten. Also, the recipe says to store them in the refrigerator. I have always just stored them in an airtight container and they stayed fine. I know what you mean. I got a container of these for a gift--they were gone the next day. Oh well, it's Christmas:)! Hi, I found your blog by googling for how to soften Hershey Kisses. I'm having a hard time getting my kisses to melt at all... after several minutes in the oven, they just crumble when I try to press the M&M into them. I'm doing a variation, as well, with Rolos and pecans, and those are coming out beautifully! These are also delicious made with Rolo's (caramel filled chocolates) with a pecan on top if you like. Try melting the pumpkin Hershey's kiss on top of a small waffle style pretzel. Once removed from the oven, put another pretzel on top. Deeeeeelicious! i had this problem once with melting chips to dip the pretzels and we discovered that the chocolate was old. if it sat in your cupboard or even the store might have goofed and sold you old chocolate kisses on accident, thats a possibility. I hope this helps!